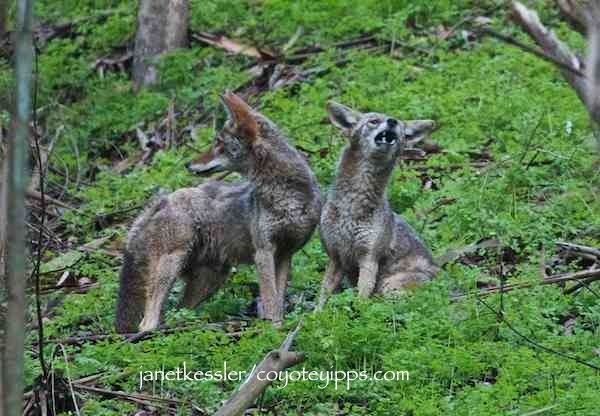 Coyote ears are large and their hearing is keen. 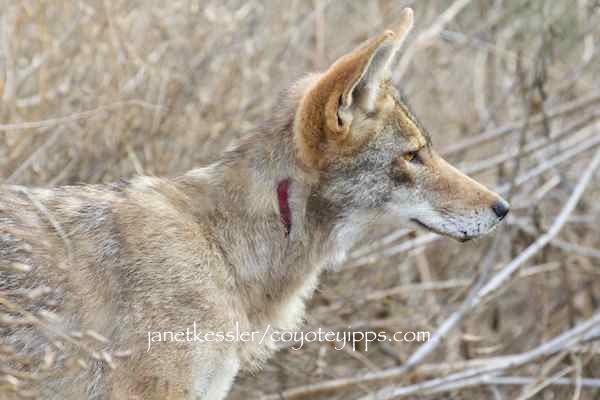 Ears are crucial for a coyote’s hunting and self-protection. Even though protected by fur, sometimes, a foreign object can get in there and get stuck. The usual response of the animal is to shake its head, rub the ear with a paw, or scratch at it with a hind leg. All those tricks had been tried by this young coyote here, but these activities were not intense. As I watched her during the afternoon, what stood out was the way she held her one ear — the left one — really low. What could have been causing the problem? Could something have entered into and be lodged in her ear? It’s well past foxtail season. Foxtails are the nemesis of all dogs in the area. These foreign objects have to be surgically removed because, since they are grass awns — barbed seeds — they work their way IN and can’t come out — it’s a one way journey. These barbs can cause infections in many dogs and having them removed helps keeps our vets in business. I’m wondering how a coyote might cope with one of these, especially if it causes an infection. Since the next day this gal was okay, I’m going to assume the ear problem, however annoying and irritating, involved something small, such as a bug or small grain of debris. 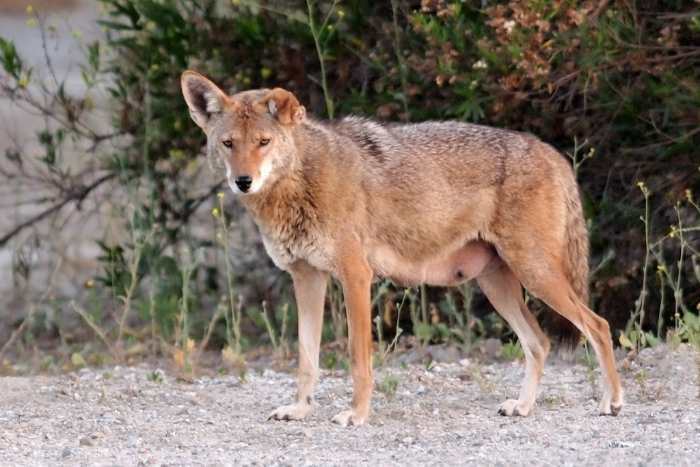 “Mom” in the Los Angeles coyote family which Charles Wood wrote about for this blog (enter “Charles Wood” into the search box to find his postings) had an ear which shriveled up due to end stage otitis, according to a vet contacted by Charles. It resulted in a permanent disfiguration and therefore an identifying mark for her. This new wound stands out, not only because it was not there yesterday, but because of its flaming blood-red coloring. This is a four-inch gash which, however, looks as though it has not ripped through the skin. My guess is that it was caused by some man-made item which the coyote encountered during a recent trek. Living in the wild is not easy. Let’s not make it any harder for them. If you have pipes or anything sharp which could injure our wildlife, please try to remove these things from your yards. Our wild animals do not have the benefit of medicine which we and our domestic pets have. Let’s hope this heals quickly without getting infected. We tend to forget that animals go through the same ailments and injuries that we do, only they don’t have medicines to help themselves out. I guess it really doesn’t matter, because nature seems to work pretty well. This coyote had an oozing eye infection which progressively got worse for a couple of days, but his immune system must be a healthy one because as of today, a week later, the eye looks like it’s back to normal. The watering eye may have been a minor hindrance for a few days — he may have missed a few hunting opportunities, but it probably did not slow him down in any major ways. The eye may have been scratched either by a gopher the coyote had caught, or possibly by a twig he had brushed up against. I’m reminded that injuries can happen at any time to any of us by a friend who recently took her dog out for a hike along a rustic trail, and upon returning found that he had jabbed himself with a stick which went in a full two inches. The dog had to have surgery and stitches! 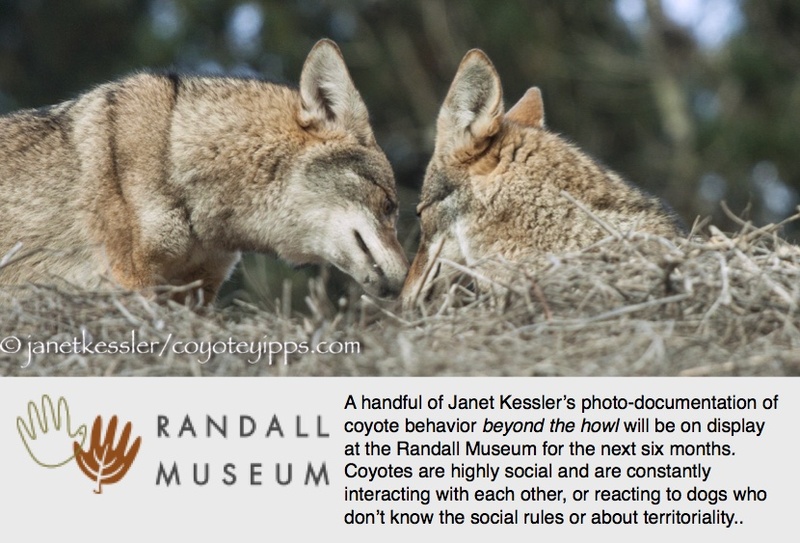 Coyote siblings provide companionship, affection, rivalry and . . . health care, as seen here by these grooming activities. It’s a bad year for bugs: ticks and fleas. The coyote is pulling off ticks. The activity is mutual — sometimes one is the groomer, and sometimes the other. Shortly after I took the video, the groomer, guy to the right in this case, snapped at a bug in the air — see photo below. The bugs are on them and around them! Must be extremely annoying for them. 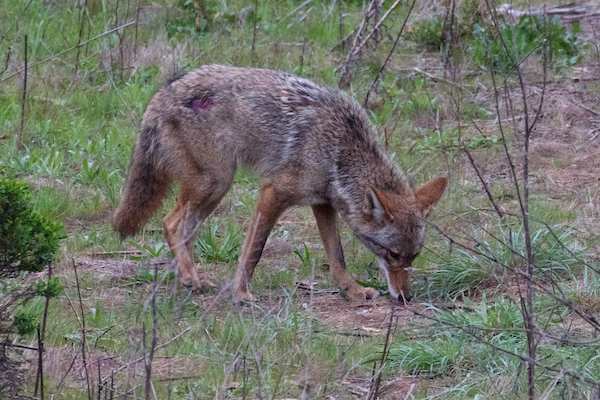 I’ve never seen coyotes scratch this much in the San Francisco Bay Area. It’s constant. When they’re not scratching themselves, they are helping a sibling! Pretty altruistic, I would say! 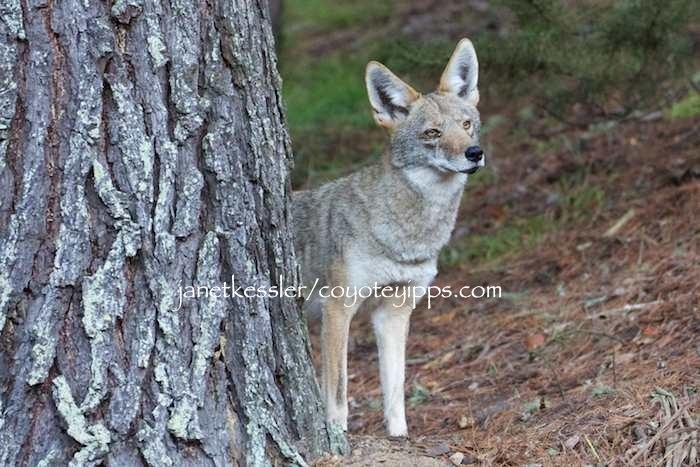 By the way, coyotes are also shedding their winter coats at this time of year, which adds to the irritations they feel. Scratching, in fact, helps with the shedding process. I don’t know if this wound to the hip, above, is due to a skin ailment or a wound from a fight, possibly with a raccoon, possibly with another coyote? It looks like it’s about 3″ in diameter. It appeared about a week ago. 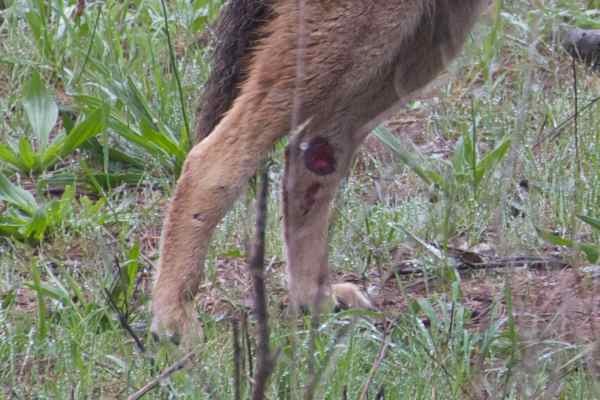 And now, just as the inflammation and and bright red color are subsiding, I discovered a bright red gash at the ankle joint of the left leg, while the other leg, too, seems to have been scraped-up or punctured — all on the same coyote. What could have caused these? We tend to forget that wild animals sustain injuries constantly, and their bodies must heal themselves without the aid of antibiotics or other medications that we humans and our pets take for granted. Wound to left ankle area, and scraped up right leg.